Lovely traditional property built in the classic “Perigourdine” style, set in large, peaceful gardens with a good sized, heatable, infinity pool. 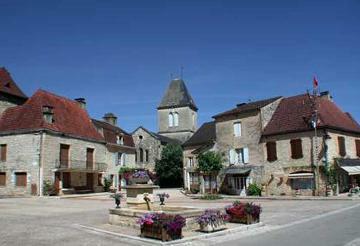 Located in a charming hamlet near to the historic centre of Sarlat 15km. Local shops 3km. The accommodation comprises a large living and dining room with fireplace and sofa bed. Open-plan, fully equipped kitchen. Double bedroom (1 x 140cm wide bed) and a twin bedroom (2 x 90cm wide beds). Shower room and toilet. Décor is very pleasant with stone walls and exposed beams adding lots of character. Furnishings are practical and traditional in style. The garden is delightful, with plenty of lawned areas and a super pool with an overflow effect at one end. The pool can be heated on request for a supplement payable locally, a good idea in low season. Property made available in good order and fully equipped. Local taxes, reasonable consumption of services including water, gas and electricity. Garden and swimming pool maintenance. Refundable cash deposit payable locally 500€ (or equivalent) and credit card details held for a further maximum 500€ if required in case of damages or additional costs. Obligatory end of stay clean payable locally 38€. Linen is not provided nor available for hire. Pool heating (if used) is payable locally according to the meter reading. Heating for the house and firewood. Additional services (where available) including cleaning, babysitting and cooking.